Northwood Carnival Covered Butter is in mint condition. Made before 1925 (Not trying to sarcastic, but they closed in 1925). 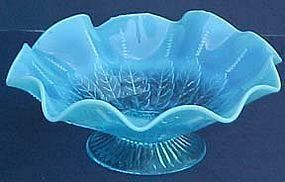 Northwood's New Leaf Blue Opalescent footed Bowl is just under 8.5" across. Made in the 1910's (teens), in excellent condition. 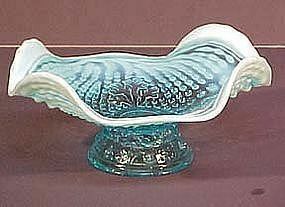 Northwood Nautilus Blue Opalescent BonBon measures 8"x7"x3.5" high. It does have the Northwood logo imprinted, but very very faint. Made around 1912, in excellent condition. 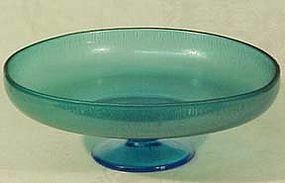 Northwood Jadite Console Bowl made in the 1920's. In good condition (has a few minor scratches). 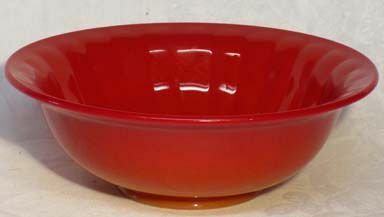 Bowl measures 9.5" across and is about 2.75" deep.